Mr. Slash wrote: Dunno 'bout their fanbase. But at least the guys from Iron Maiden seem to be nice guys. Their fanbase are dicks (at shows, for the most part). I’ve heard they’ll just completely ignore the opening acts before Maiden comes on. That might be the case. However, I always have this mentality that the set will always be a net positive for an opening band if only one person or more in the audience that did not know the opening band became a fan in the end, and would want to see a headlining show. I felt this way with AB opening for Breaking Benjamin and Disturbed in 2016. I feel the same with Tremonti opening for Maiden. I think what you've heard is an exaggeration. Maiden is my second favorite band after AB and I've seen them probably a dozen times. I've never been in a crowd that was rude or hostile to any of their openers. With any huge headliner, the audience may not be super enthusiastic, but that's not unusual. I suppose it could be different in other parts of the world, but Madien audiences in the US have been fine with the openers. Headline show September 14th in Greensboro. austin. wrote: Headline show September 14th in Greensboro. 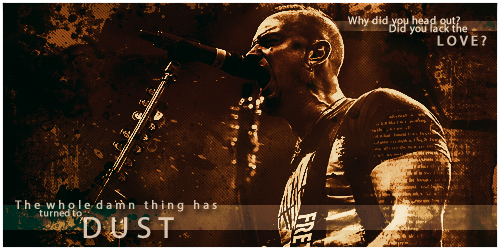 Is Tremonti anyone else's FAVORITE band? I have no tattoos but really am strongly considering getting a small Tremonti logo on my back shoulder area. The music is just....everything I want in a hard rock band. Can't wait for show number 4, bring all you got and crank it up loud mr Tremonti! austin. wrote: See you there bro? Certainly hope so! Not sure who I’ll be going with yet, that’ll have an impact on whether I go for the rail or not. So I am thinking about going to the show in West Dundee, IL on 10/04. But I can't find anywhere who they are touring with. I am assuming that Tremonti is headlining, but does anyone have any idea on who else may be playing? I heard the tremonti show tomorrow is going to stream live, does anyone know where I can watch it? Didn't know that Tremonti was on Wacken this year (to be more precise: today). Here is a snippet of Garrett's Twitter, where you can see him playing Catching Fire. I'm really curious how Mark's voice sounded this time. The last performance of that song was pretty poor back then. DeadCell wrote: So Tremonti is supporting Seether on this tour, gross. Seether? Crap. I am sick of them supporting Seether lol. I thought they were headlining. For some reason I thought this 10/04 show was the start of a separate tour. I have no idea why, haha but it did not say anything about other bands and it didn't say it was the Poison the PArish tour with Seether or whatever it said it was the "A Dying Machine Tour," so I thought it was them headlining. Argh! Actually after looking at it, it may be a one off headlining show. That would be great. If that’s the case, you’re lucky. I’m thinking I could find better ways of spending that money, because I have no interest in seeing Seether. And a 45 minute set for Tremonti isn’t enough. Heh, the only way Seether could put together a GOOD set longer than 45 minutes is if they played Disclaimer II in its entirety. DeadCell wrote: If that’s the case, you’re lucky. I’m thinking I could find better ways of spending that money, because I have no interest in seeing Seether. And a 45 minute set for Tremonti isn’t enough. Heh, the only way Seether could put together a GOOD set longer than 45 minutes is if they played Disclaimer II in its entirety. In all fairness, Poison the Parish was a step up in comparison to their two albums prior to it. Still, Disclaimer II and Karma and Effect, to me, is their standard bar. Some of the songs from Finding Beauty In Negative Spaces are all right (Rise Above This is a really great song with really powerful context behind it). In any case, hopefully, Tremonti can do a full Fall headlining US tour and I hope I don't have to wait until early 2019 for them to come to Southern California. If that is the case that would certainly be wonderful! And honestly I'm not a huge Seether fan. They are ok, I enjoyed some of their older stuff but never got hugely into them. Also, what's with the Comic Sans overlay? What is this, 1996? Hallelujah. For some reason the VOD didn't work for me the last 12000 times I tried. But now it works.